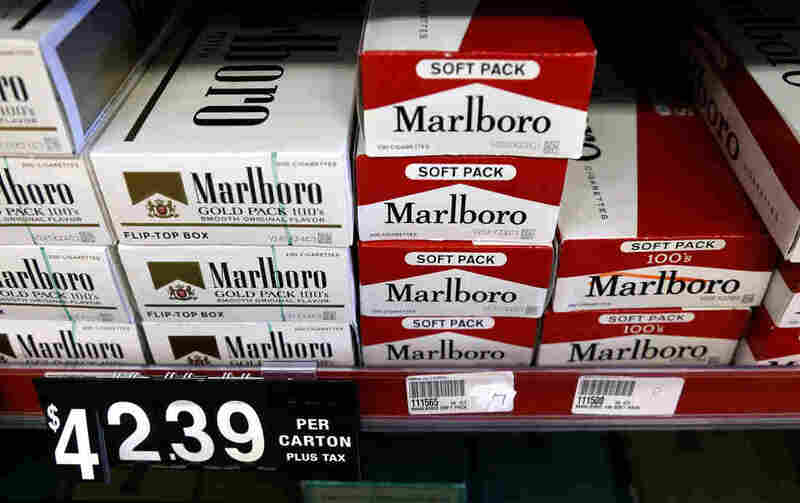 Why Tobacco Companies Are Spending Millions To Boost A Cigarette Tax : Shots - Health News The tobacco giant is supporting its first cigarette tax — 60 cents more per pack. But some health groups oppose Missouri's ballot measure, as do some education groups that would benefit from the tax. Cartons of cigarettes on shelves at Discount Smoke Shop in Ballwin, Mo., in 2012 were much cheaper than cigarettes in most other states. Missouri's tobacco tax is still only 17 cents per pack, but will rise if either of two state ballot measures passes this month. For many Missouri health advocates, an increase in the state's tobacco tax is long overdue. But onlookers might be surprised to hear that tobacco companies are spending a fortune this election year to get one or another increase in that tax passed, while health groups are urging a no vote. At 17 cents for a pack of cigarettes, Missouri's tax is the lowest in the country — a fraction of what you'd pay in many states. New York's tax is the highest at $4.35 a pack, for example, and Florida ranks around the middle of the states at $1.34 a pack. Missouri's cigarette tax also hasn't changed since 1993. Health groups like the American Lung Association say Missouri's low cigarette prices contribute to one of the highest smoking rates of any state in the country: Twenty-two percent of adults in Missouri smoke, according to data compiled by the Centers for Disease Control and Prevention. On Nov. 8, Missouri voters will decide whether to approve not one, but two tobacco tax increases. This time, however, health groups are actually urging voters to leave the tax alone, while tobacco companies are lobbying the electorate to vote yes. "We had big, right-leaning people mocking us," Rallo says. "It was rough." So Rallo and supporters decided instead to try to create a tax through a ballot measure. Their polling showed voters might approve an additional 60 cents a pack — and that's the tax increase they're proposing. 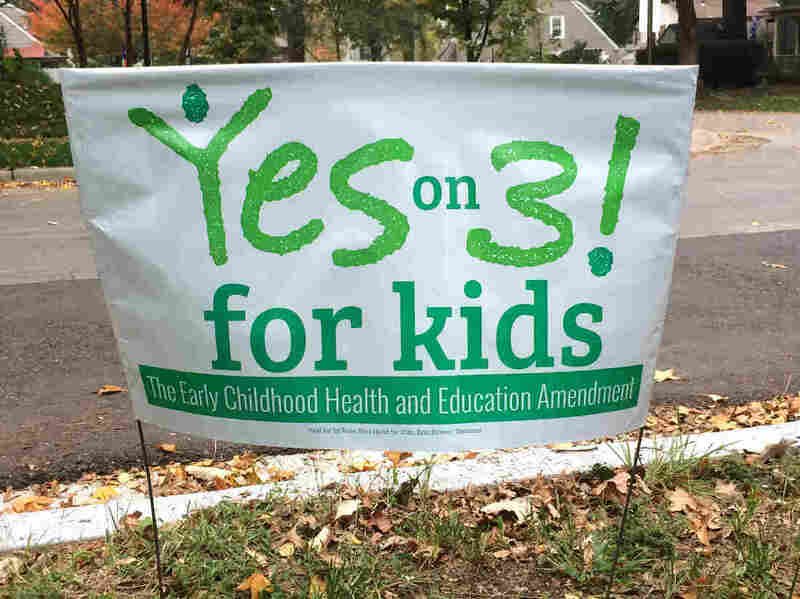 They estimated that their plan, which became Constitutional Amendment 3 on this month's Missouri ballot, would generate around $300 million a year to fund mostly early education, with some funds going to smoking cessation and to health facilities that provide health care for children. Rallo says her group reached out to get the help of health organizations like the American Lung Association. But there was a problem with her amendment, some public health researchers told her. Public health data suggest the size of the tax in Rallo's amendment is too small to make a difference in smoking rates. "Raising prices of tobacco products, we know, is the most effective way to prevent people from starting to smoke, to help people not get addicted to tobacco products and — for those who are smoking — to help them quit," explains Dr. Doug Luke, director of the Center for Public Health Systems Science at Washington University, in Saint Louis. But the size of the tax, research shows, has to be big enough to make people think twice before buying that pack of cigarettes. Washington University has come out against Amendment 3, as has the American Lung Association, which argues that the amendment's schedule of gradual increases in tax over four years would also keep it from having a big influence on smoking rates. Rallo says it was this sort of disagreement over the size of the tax that caused her talks with health groups to break down. "It was basically, 'It's my way or the highway.' So we took the highway," Rallo says. "And when you're going down the highway, you might pick up an interesting companion." That "interesting companion" is tobacco giant R.J. Reynolds. Since December of 2015, the company has donated more than $12 million to committees supporting Amendment 3. Missouri's Amendment 3 would increase the tax on cigarettes by 60 cents. Alternatively, Proposition A would tax all cigarette brands in the state by 23 cents. But that's not the end of the campaign's complications. Amendment 3 also pits the big tobacco giant against smaller manufactures, known collectively as "Little Tobacco." As the result of a national settlement in the late '90s, big tobacco companies right now must pay the state a special fee that that their smaller competitors don't face. Rallo says the fee allows these smaller companies to undercut firms like R.J. Reynolds, in their price per pack. "You have such a low price on cigarettes — such a discounted price — that it's very easy for low income people to buy cigarettes," Rallo says. Amendment 3 creates an additional tax increase for the little tobacco companies that don't pay the fee. Rallo says that extra tax is meant to stop the small companies from being able to sell cigarettes at bargain prices. But little tobacco has fired back. They've thrown their weight behind a different ballot measure — Proposition A, which would add a smaller tax (23 cents a pack) on all brands. That way, the smaller producers would still be less expensive than Big Tobacco's cigarettes. Meanwhile, many education advocates aren't crazy about how the tax money raised by Rallo's proposed amendment would be spent. Rather than earmarking it for public schools, the money raised by Amendment 3 would be available as grants that could alternatively go to religious or private education groups. Rallo says these other institutions provide a lot of pre-K programs in Missouri and are better prepared than public schools to expand in many parts of the state. Proposition A's money would fund infrastructure projects. The numerous debates and controversies that have arisen from Amendment 3 have led to some alliances never seen before, and to shifts in many of these groups' default positions on tobacco and taxes. "This becomes very confusing to the public," says Luke. "They see multiple bills on the ballot. They hear that public health groups are arguing about this. And even the tobacco industry is fighting itself, which is very unusual." Groups like Tobacco Free Missouri, the Health Care Foundation of Greater Kansas City and Campaign for Tobacco-Free Kids have joined fiscal conservatives in opposing Amendment 3. These anti-smoking groups worry that creating such a small tax now might eliminate the chance of future tax that would be big enough to significantly change smokers' behavior. "There is a sense here of, 'At some point we need to get something passed,' " says Luke. "But that's not how you do sound policy."